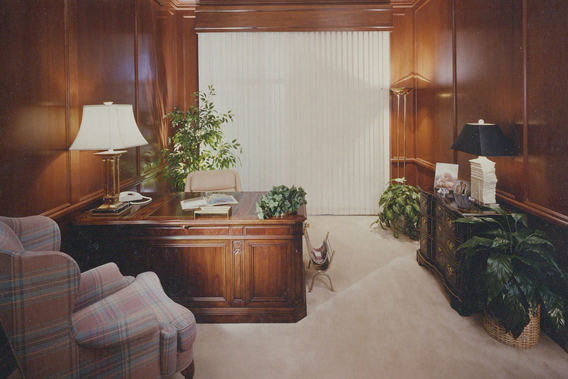 For over thirty years… John Harding Dey, ASID Interiors has provided design services in a wide range of industries from the banking industry, offices, corporations, manufacturers and distributors, health care, retail, educational facilities, and of late, centres of Worship. Design is about information gathering, research, conscientious decision making, planning with contingencies, and systematic execution. The principles apply to almost all businesses. John’s experience is especially well suited to small and medium size business where his fees and services are tailored to the needs of the company. The interior design of a corporate facility can require a vast amount of details, whether it is a renovation or expansion. It is one of the most critical, expensive and stressful undertakings one can experience, yet very rewarding at the same time. John Harding Dey understands that our corporate client’s commercial facilities not only reflect their brand and identity, but also their future vision as well. My job is to successfully blend corporate interior design into an efficient, productive and attractive working environment, and in doing so, responding to my client’s requirements while keeping within the budget and program. I am aware that each project is distinctive in its style, character and image, and reflects the specific individuality of the client. I am determined to make certain that my client and the image their company wishes to project, comes through in every interior design project I undertake. Because I am flexible, I am able to tailor my services and thus meet the distinctive goals for each project. Careful space planning is the heart of all good design. I will provide the client with a comprehensive floor plan, which includes lighting, electrical, air conditioning, floor and wall finishes as well as furniture layouts and color scheme. In corporate design it is essential to cover all aspects of the design before any space improvements or purchases are made. Regular site visits during the project ensure design details are correctly implemented. After the completion of the design, this is an essential and valuable service that a designer can provide. Often contractors and installers choose to substitute products and materials in order to save time and money on a project without realizing the impact this would have on their design. My complete attention to detail and dedication, budgets and schedules help guarantee the success of each project. My scope of work ranges from small departmental renovations to new multifunctional facilities. I am proud of the fact that many of my clients continue to return to me for on-going renovations as their requirements change.